More than 1300 participants from 62 countries entered the Aquaculture Europe 2017 conference in Dubrovnik last week. The three days symposium is one of the most important event for the aquaculture sector. This year more than 400 presentations explored the solutions for long-term sustainability and long-term stability of fisheries under the theme of “Cooperation for Growth”. 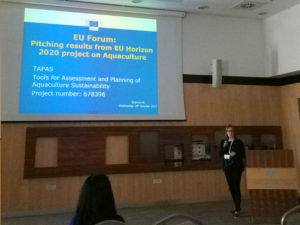 Lynne Falconer presented TAPAS at the EU forum, a special session organised by the European Commission to pitch results and expected outcomes from EU-Horizon 2020 funded aquaculture projects. 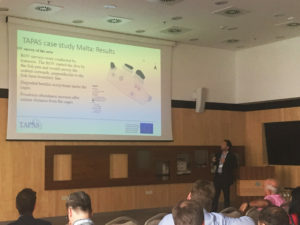 During the Integrated Multi-trophic Aquaculture session, Tamás Bardócz presented the initial results of the Central Mediterranean case study, describing experimental trials for IMTA in Malta. Frank Kane presented "A critical review of the existing aquaculture licensing and regulatory frameworks in the EU" during the Governance, Policy and Planning session. This presentation outlined some of the major results to date for TAPAS and highlighted some of the bottlenecks identified as part of the review. The questions received after the presentations indicated a high interest in the scientific community for the TAPAS project. TAPAS information stand was set up at the AquaBioTech booth where conference attendees could find out more about the project.